Bellwether Coffee, a leader in next-generation coffee roasting for retailers, announced today an industry advisory council. Comprised of recognized and distinguished leaders in the coffee industry and tech, the council is assisting the company with business strategy topics ranging from product manufacturing and quality control to green coffee, supply chain, and sustainability. The strategic advisors include: James Hoffmann, author and founder of London’s Square Mile Coffee Roasters; Tom Barr, former VP, Global Coffee, Starbucks; Pete Rive, co-founder, SolarCity; Colleen Anunu, director of coffee supply chain at Fair Trade USA, director of the Specialty Coffee Association; Chris Baca, co-founder and roaster, Cat & Cloud Coffee; David Isett, former president and CEO, Concordia Coffee Company; Jamie Smith-Weise, head of coffee and quality assurance, Coffee Manufactory and Adam Reineck, global design director, IDEO.org. “It’s incredibly exciting to work with a company that’s genuinely pushing into the future of coffee roasting – a future of sustainable, decentralized, smarter coffee roasting,” said James Hoffmann, founder of London’s Square Mile Coffee Roasters. Bellwether’s electric, ventless, zero-emissions commercial coffee roaster is the most consistent and controllable roaster on the market, and the lowest carbon footprint roaster ever made. Bellwether Coffee’s revolutionary roasting platform provides its customers the ability to roast and share delicious coffee in-store, responsibly source green coffee from its curated marketplace, and create direct connections with coffee farms around the world. Earlier this year, the company announced a $10 million Series A financing round and more than $6 million in pre-orders, which include a leading U.S. grocery chain. 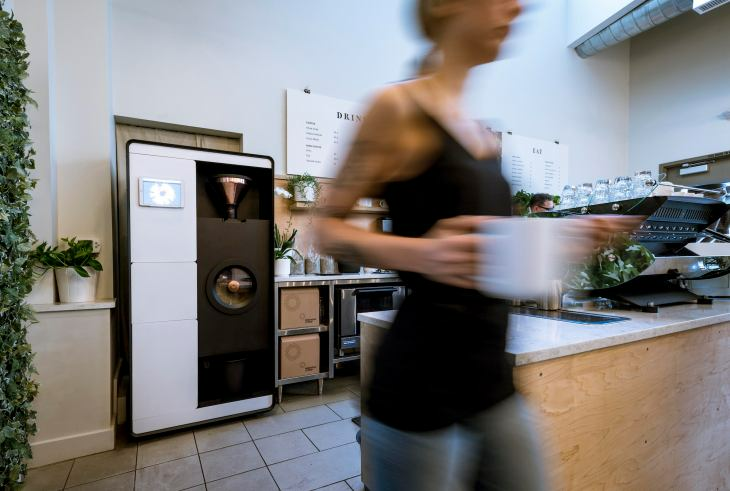 The roaster is available to business owners through lease and purchase options, allowing cafes, grocers and other businesses to easily begin roasting their own coffee and start saving money immediately while delivering unparalleled fresh coffee. The machine itself does not require any venting, gas lines, or roasting experience to operate. The intuitive software makes buying green coffee, roasting, and managing inventory simple, and was designed to fit in with existing operational workflows.